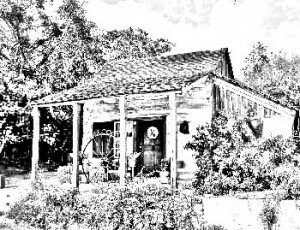 Gerhard Rorig built thislog cabin as shelter from the first winter in Fredericksburg in 1846. Johann Loeffler, a local cabinet maker, added the rock and half timber rooms and cooking fireplace around 1867. His son-in-law, J. Charles Weber, added the lean-to on the side. The house stayed in the Leoffler-Weber family for 90 years, when George and Gloria Hill bought the house and restored it. The lean-to was converted into a bath by the Hills in the early 60s. Notice the front door. Our ancestors were not as tall as Americans are today. Today, the Loeffler-Weber House is a guesthouse, and can be booked through us.